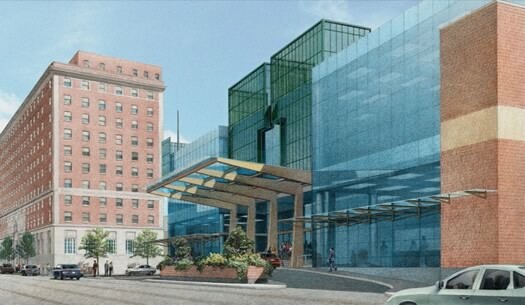 The Albany Convention Center Authority revealed a bit more about the revised plan to build a scaled-down, $66.5 million convention center at Eagle and Howard streets in downtown Albany. An ACCA slide deck about the project is embedded after the jump -- it includes some renderings and details. Also there: an clickable map with estimated building print. This new plan replaces the original proposal for much larger facility on the southern end of downtown Albany. That plan fizzled over the last few years under concerns about cost and whether the project could float financially over the long term. The authority is touting the new project -- about a third the size of the of the other project -- as a "hub" between the Empire State Plaza and the Times Union Center, with all three connected by a covered walkway and 2) feasible under the approximately $70 million already allocated/promised/set aside for the original convention center. It projects a timeline that includes a possible completion date of July 2016. There are still a handful of questions and uncertainties about the project. This article from the Biz Review's Mike DeMasi covers a lot of them, along with other details about the project. And what of the south side downtown land gathered for the original project? JCE reported in the TU today that the authority is planing to issue a request for proposals for a mixed-use project on the site. The slide deck is in large format above -- click or scroll all the way up. Aaannd... apart from the inconvenience of construction, the proprietors of the City Beer Hall just crapped themselves thinking about this potential windfall. I like the idea of building something at that particular site, and I like the idea of it connecting ESP & TUC. But I'm still not sold on the idea that Albany needs a convention center. I think this scale is much more appropriate, but it still doesn't answer my big question, "who would want to go to a convention in Albany, NY?" Seriously, we just aren't THAT kind of city. Wake me up when an aquarium is built downtown. Let's see, we already have two convention centers in Albany. The first one is in the concourse of the state mall. The Knickerbocher Arena was built as "A CONVENTION CENTER"! Maybe you can fool some of the people some of the time. But , i am not fooled by this unessarry expenses to the taxpayers of NY! Another issue about building the center at the Howard st location is moving the GreyHound station out of Albany. This is the capital of NY state i would really appreciate it if they would keep the bus station here. Why should we have to pay for a cab, in additon to the bus fare to travel out of town ! DO NOT MOVE IT TO TROY, LIKE THE TRAIN STATION! How about we fix the city's sewer system instead? You know the one that backs up sewage into citizen's houses and dumps raw sewage into the Hudson...that one. I believe "porte-cochÃ¨re" is French for "crazy idea." Albany is NOT designed to handle the kind of traffic that a facility like this would bring to downtown. It can't event handle "Alive at Five" traffic during the summer when the city is void of everyone except the concert goers. Seems that the firm that did the traffic study may have a hand in downtown development... oh wait they do. FOUL! If you think Albany "traffic" is bad, you must never have experienced any other city. Why do we have a convention authority? Sounds like a huge waste of tax payer money to me. Their executive director makes $119K a year to do what exactly? Dream about a convention center for the past 5 years? Hello wasteful spending! The jobs. Yeah, how many high paying convention center jobs do you know of? None come to my mind. So there are 157 minimum wage jobs for people to work in kitchens only when there are conventions going on. Doesn't sound real permanent to me. It's been mentioned before, but we have the Times Union Center and the convention center in ESP, as well as the conference spaces in the Hilton, so why do we need more meeting space exactly?